The Crawley Club (CADMAC) was formed in 1960. Today we have about 100 members. All types of models are flown, radio control, free-flight, control-line and indoor. Club meetings are held weekly on Thursday evenings during the summer on Holy Trinity School field and during the winter on Thursday evenings at the Hazelwick School Sports Hall. 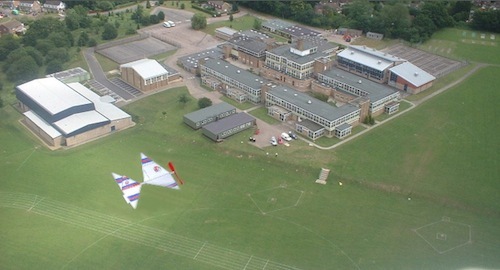 In the winter CADMAC enjoys the use of the Hazelwick School sports hall for a Thursday evening of free-flight and RC flying. We have a full schedule of slots to accommodate all types of models in a safe fashion. In the summer Club meetings are held every Thursday evening on Holy Trinity School field (pictured below). Access to the school is via Buckswood Drive, turning into Woburn Road and then left through the school entrance and into the car park. The majority of members have been aeromodellers for many years, so the club has a vast store of knowledge. We welcome new members, who can be assured of friendly advice and assistance. These two events have been combined this year and takes place on the first thursday club-night back at Holy Trinity. Roll up with your unwanted aeromodelling items, models, motors, kits, books, mags, etc for swapping, selling and even to give away! Bring along your latest creation to be judged for workmanship by all members attending. Models to be presented by 7:30pm, judging at 8pm. 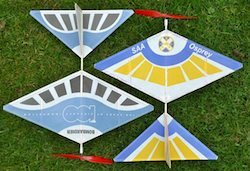 The 2019 SEBMFA Crawley Free Flight Indoor Meeting took place on SATURDAY 16 February at the K2 Leisure Centre, and by all accounts it was a great success! Planning will soon start for next year. Watch the K2 2019 video made by Daniel Senior. The club has a facebook group, which can be used to advertise the club, by swapping pictures and stories until someone volunteers to take over editing the Turbulator. Anyone can see the group, but you'll need to click the 'join' button (and be approved) before you can post. This Competition will run from thursday 3 May until thursday 26 September. Summer contests on Thursday Club nights for small free-flight models from 7pm to 9pm.